Bayonet RTDs, Thermistors and Thermocouple temperature sensors are commonly used in extruder and plastic processing industries. These sensors provide accurate temperature control for the best plasticizing combination of plastic material, mold and design. The 6 standard design's are available to meet the requirements for space conservation while the cap and spring are provided to insure optimum contact with the process. With a pipe clamp adapter, the sensor can also be used to measure pipewall and bearing temperatures. The samples shown are Dual Type J Thermocouple Temperature Sensors, Teflon insulated configuration. This provides an operating temperature range of -50 to 250oC. Fiberglass insulated wire is also available. The length of the tip, sheath, transition and lead wire are specified by the customer to suit the application. The lead wire can be supplied as bare wire, terminated with plugs, jacks, spade lugs, or junction boxes. For long cable runs, stainless steel overbraid or flex armor can be added. Special Limits of Error also is available. These temperature sensors configurations can be manufactured as RTD's, Thermistors, Thermocouples. 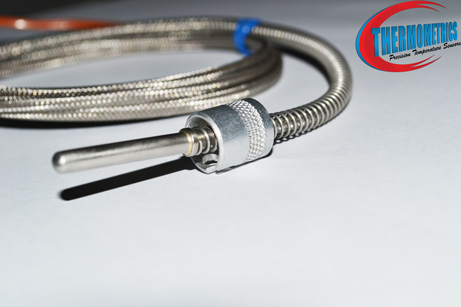 Types, T, J, E, K, N, R, S, B Thermocouples.